With an approaching blizzard or just heavy snow fall, a bike should be protected against all of the elements. As with any storm, Mother Nature can play a dangerous role against you and your bike. NEVER ride into a snow storm, it may seem like a fun idea, but it is very dangerous. Riding a motorcycle in slick conditions like rain is dangerous enough – riding in snow is just plain careless. 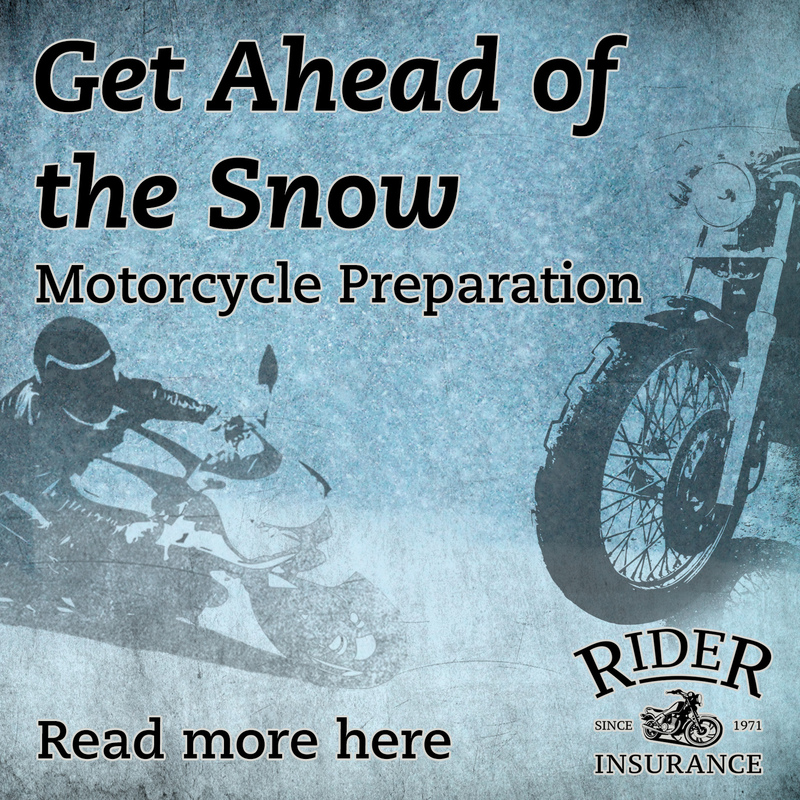 A round motorcycle tire will have trouble keeping traction on the road in slick snow or icy conditions. Snow in and of itself can be dangerous, but under it may be ice or black ice. Driving a car on black ice is usually a bad idea, imagine trying to balance two-wheels on it (it is not like ice racing, those bikes are specially designed for ice). 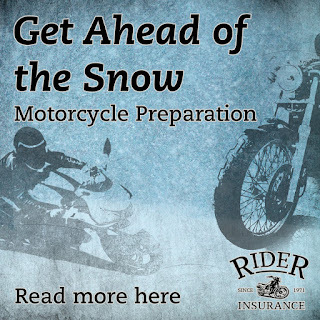 Make sure your motorcycle is protected from snow. Obviously storing a motorcycle indoors is the best option, but not everyone has that option. Store your motorcycle in a garage or shed. Remember that an issue with snow is the weight it carries, so make sure the structure of the shed or garage is very sound. You wouldn’t want the roof to collapse onto your motorcycle. Covering the motorcycle is always a good idea, especially if the roof leaks a little bit, or something falls over. Covering the motorcycle in layers will protect the motorcycle even more. Just make sure to uncover the bike after the storm so that humidity is not trapped under the layers causing the motorcycle to oxidize. If the motorcycle is being stored outside, any kind of covering will help protect it. Parking it under an awning or porch is better than no protection. DO NOT park it under a tree limb! Remember the weight of the snow can cause the limb to break from the tree and fall onto whatever is below. A big branch can total a motorcycle easily. Anything hanging over the edge of a wall or building should also be avoided. Snow is heavy and can move a lot of things. Parking the motorcycle on a tarp may prevent ice from forming under the bike. The edges of the tarp can also be pulled up and around the bike. A cover can be put over everything and secured tightly to seal the bike in. Covering the motorcycle in layers such as moving blankets and covering everything again with a tarp is great to create a weather tight seal. All layers should be very secure with bungee cords and ratchet straps. If the storm is calling for high winds, secure the bike with straps to something stationary on the ground or to a building. Mark the bike with cones or something tall and reflective in the event the motorcycle is buried by snow. This will make the motorcycle easier to locate when digging out and visible to plow drivers or helpful neighbors that might not realize your bike is there. Be very careful digging the bike out of the snow. Do not use a snow blower, because it may damage the motorcycle. Carefully brush the snow off the motorcycle and use a shovel to remove the snow around it. Sometimes a leaf blower can effectively blow the snow away. If the bike needs to be moved, carefully move it watching for ice that may have formed under and around the bike. Do not pile snow behind the bike, as it may melt and cause water to drain down the motorcycle and freeze to ice. Riding after a snow storm can also be dangerous due to ice and road conditions. The roads will likely have been salted. Salt causes rust and oxidation on motorcycles and cars. Large deposits of snow and ice can be pushed into the middle of the road making it very difficult to traverse. The safest option is not to ride the motorcycle at all while snow is on the ground. Protect yourself and your motorcycle and ride safely.